Buy online 1,500 sq. ft. Unison Premium 2-in-1 Underlayment Value Roll 70-025-15 and leave review or share with Your friends. 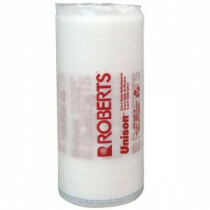 Roberts Unison 2-in-1 Underlayment for Laminate and Engineered Wood Flooring is designed with a 3/32 in. polyethylene foam for cushioning and a 2 mil thick top film to protect from harmful moisture vapor. This product is designed for on or above grade installations. Unison's foam construction also reduces everyday surface noise. It's easy to install with a plastic overlap and adhesive strip to join multiple rolls. 1,500 sq. ft. coverage with roll measuring 375 ft. x 4 ft.